"manages to impress by the quality of the relationships some of the characters have, even in those very strange circumstances"
“I’m back, you bastards!” is how Myrtle “Tilly” Dunnages (Kate Winslet) makes her entry. A very powerful intro indeed, but considering how she’s seen by everyone in her tiny home town, it will not amaze you. Tilly is a mysterious seamstress, who we find out has been sent away from her town after supposedly killing a boy in the past. She comes back to the place she once called home in order to help her mother, or that is what we are led to believe. However, ‘The Murderess’, as the people of the town call her, is back as a totally different person: one very secure of what she wants and that isn’t something which necessarily makes the people of Dungatar happy. She is faced with a crazy mother, a not so secure home and not many friends, but that doesn’t stop her. She uses the best of her talents and eventually manages to sort of bribe the women in town to be not necessarily be friendlier, but just civil. Of course, as in all stories, she has both helpers and people who are there to stop her from succeeding. Among her helpers we can count Teddy McSwiney (Liam Hemsworth), a very handsome young man who becomes instantly interested with the new comer. Teddy offers her much needed support which sometimes she doesn’t even know she requires. He gets his way eventually and gets as close as he wants to this woman of the world. Apart from Teddy, there is also Farrat (Hugo Weaving), a warm and very sensitive police sergeant who has quite a thing for colours and fabrics and secretly cross-dressing. He is the one to support her in a key moment, and in order to pay for his own sins he take the blame for something Tilly does. The story develops quite naturally: she comes back, everyone is in shock, including Mad Molly (her mother) as she doesn’t recognise her to begin with, and then the plotting begin. Between trying to discover the truth of why everyone thinks she has murdered a schoolboy named Stewart Pettyman, as she wasn’t able to remember any of it, she tries to stay somewhat civil with everyone, but she is not allowed and eventually the drama hits us. 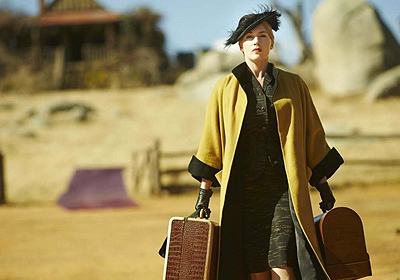 The Dressmaker is beautiful when it comes to costumes and the sarcasm some of the characters let out is great, but lacks a properly rooted plot. Kate Winslet’s performance is a grand one; her overall attitude feels like a very fitting one. She is stable, powerful and there to impress. Judy Davis as Molly presents us in a funny yet personal way with the different faces a person with psychological problems might have. In her few moments of lucidity we discover a persistent woman who believes in her daughter and who would do anything to help her. Her mother is also the one to provide Tilly with her final incentive to take her revenge too. The Dressmaker manages to impress by the quality of the relationships some of the characters have, even in those very strange circumstances. It’s a film about putting feelings to rest and having the power to shut the door behind you and move on to better places.